What is this on my grapefruit? I've lived in a house for eight years now with six different citrus trees. Last year we trimmed them back drastically, while very shady and beautiful, it was obvious that they were having trouble producing fruit. The trees are looking beautiful again but at the moment I'm trying to find out what these spore like hair things are on my grapefruit (at the top of the picture, has the white dot attached to the top of the hair). Most of the fruit on this tree have them. 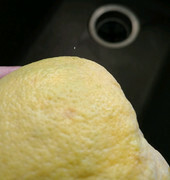 Re: What is this on my grapefruit? exactly. Green lacewing egg. Its surprising there is only 1. Typically there are several of these in row. The larvae are so voracious the first one to hatch will eat the other eggs. Hence they are elevated to avoid self-predation. Thank you so much! I have a vegetable garden so the green lacewings will be very welcome visitors! Never heard of lacewings doing that. That's a bunch of hype. Someone looking for a problem that really doesn't exist in the real world, from my experience. Man your lucky! I've spent a few hundred dollars buying lacewings trying to get them established with very limited luck, if any. I'm sure they are endemic to your area. Its just everyone is so quick to spray insecticides they may be at a low population level. I've heard that regular spraying causes more damage to the population of beneficials (like lacewing, ladybug, wasps, bees, assassin beetles, pirate bugs, ground beetles, etc.) than to the problematic species ostensibly targeted.